Fleur de sel sea salt. Pure, organic herbs. Simply the best. Divinely blessed. We will reopen soon with exciting news and events! Check back! TEMPORARILY SOLD OUT! THANK YOU! Rubbo Salt Shop is temporarily closed while we create more Rubbo Salt! FLEUR DE SEL IS PURE & PRISTINE! by solar evaporation in France! The perfect gift for the foodie or adventurous gourmand on your list! SOLD OUT! Gift packs with small porcelain salt saucer and bamboo salt spoon! My husband and I also have used Rubbo Bath Salts extensively, for pain relief as well as stress reduction and relaxation. 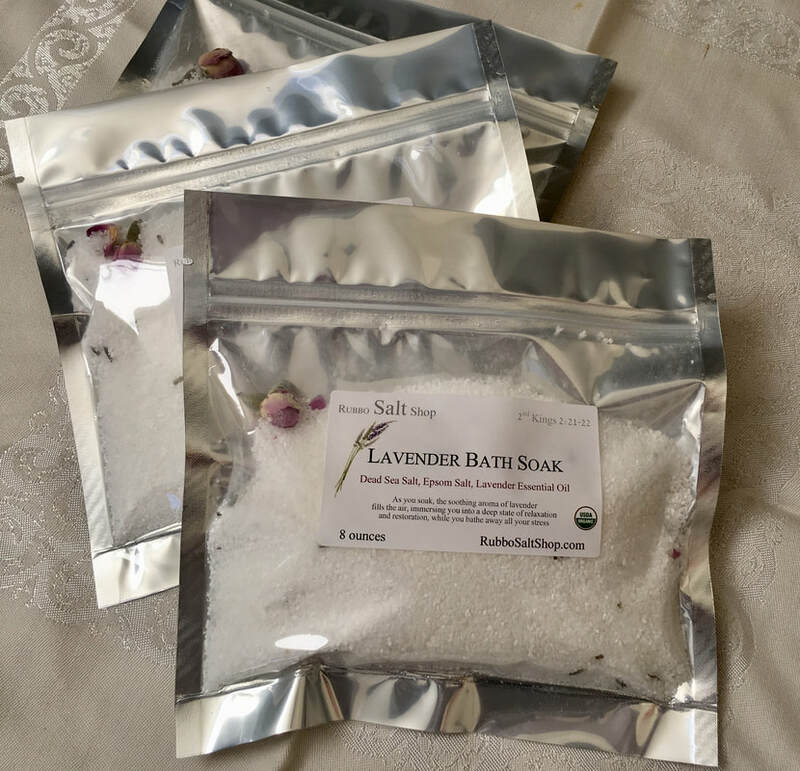 The salts we enjoy the most are mixed with the essential oil of lavender; it is sure to soothe any bodily aches and pains, and we highly recommend it! We have also used and benefited from the salts with essential oil of lemon. These are wonderful products made with love! Rubbo Salt of the Earth is a hand-crafted sea salt and organic herb blend that uses the finest sea salt in the world, and certified organic herbs. Fleur de Sel ("flower of the sea") forms as a thin, delicate crystalline crust on the surface of France's coastal seawater marshes as it evaporates, and it has been hand-raked in Guérande since antiquity. The name 'Fleur de Sel' comes from the flower-like patterns of crystals in the salt crust. Our Rubbo Salt of the Earth has been specially blended so that you can create a gourmet experience in your own kitchen, whether you are preparing vegetables, beef, pork, fish or poultry. Our Rubbo Salt of the Earth is made with only the finest ingredients: each 3 oz tin contains hand-harvested Fleur de Sel de Guérande, the crème de la crème of salts from the northwestern coast of France, and the finest of organic herbs. At the salt marshes, the salt is skillfully and slowly raked, one half inch at a time to collect a mound of exquisite crystals - fleur de sel - and they harvest maybe two pounds a day. This salt is touched only by the sun and the raker. The salt marshes of Guérande are from antiquity, and when we visited Guérande in 2011, we found the perfect combination of sun, wind, and lowland marshes, and evaporation intensifies the flavors of the nutrient-rich and trace-mineral-rich waters of the Bay of Biscay. Fleur de Sel de Guérande is revered by connoisseurs of good food as the highest culinary salt in the world. Rubbo Salt of the Earth is the ONLY blended cooking salt on the market with Fleur de Sel and ORGANIC herbs. Clean, pure, healthy and natural. Handcrafted in small batches, order now for your Holiday cooking and gift giving. We'll be at the Spring 2019 Novato Warehouse Sale! We were so inspired to find out that the seasalt we have been using is almost completely free of the microplastics that are in most of the world's seasalts. We have been researching ways to reduce waste and plastics in our packaging, to move toward sustainability with biodegradable options. We have selected a stand-up pouch, and will be ready to re-open our online shop in a couple of weeks! What you season your food with is as important as the food itself! Rubbo Salt of the Earth is handcrafted, with only Fleur de Sel and organic herbs, for a healthful gourmet cooking salt, please check us out and recommend our Salt to your friends, family, customers and patients! Thank you from the bottoms of our hearts. "Rubbo Salts truly are an amazing culinary addition to any kitchen. Our family loves the blend of organic herbs, organic spices and the Fleur de Sel salt from Guerande, France, that makes up these delicious, flavor-enhancing natural salts, and we add them to many dishes we prepare. From simple scrambled eggs to juicy roast turkey, from fresh tomato sandwiches to simmered soups, my husband, our son and I all enjoy Rubbo Salt of the Earth, and await new shipments of this delightful condiment with eager anticipation. Our whole family agrees, Rubbo Salt of the Earth makes all food taste better!" As committed foodpreneurs, we package Rubbo Salt of the Earth at a local commercial kitchen, with only the finest ingredients: hand-raked Fleur de Sel from the coast of France, and nine organic herbs, carefully selected for their flavor and health properties. Made with love, by us, for you. We love you. We send our heartfelt thanks to each and every person who faithfully supported us during the past year. May you be richly blessed and rewarded for your support, during 2018, for Donald and myself; by purchasing our Salt products, by coming by to visit, by calling us, or sending a personal email to us. For it is written in Genesis 12:2-3: "I will make you a blessing, and I will bless those who bless you... and all the families of the earth will be blessed through you..."
We pray that God will hear from heaven, and that your unfulfilled prayers will miraculously come to pass for you. And we send you our love, always and forever. May you be lifted up in love, as we pray for you in our daily prayers. Rubbo Salt of the Earth started as a holiday gift idea when Donald wanted to share his love of flavorful food infused with health-giving properties with our friends and family. He remembered the herbs and spices from his childhood, the ones his father taught him to cook with (we've written the story of how Donald's father taught him to cook in "My Father's Magic Rock Soup"), and he brought to life creating food with the love that he learned from his father, with this Salt. He shares this love, and superb flavorings, with you through Rubbo Salt of the Earth. We blend Fleur de Sel de Guérande with nine organic herbs and spices, which have been chosen by Donald for their exquisite flavor profile and profound health benefits. We'd love to have your feedback on our Salt! Click here to leave a review. Thank you from the bottoms of our hearts.